The charm of the Peter Rabbit stories evaporates before the eyes of a gardener who has had real rabbit visitors. Rabbits are energetic, ingenious and endlessly hungry, a wonderful reminder of Robert Frost's observation that good fences make good neighbors. The results of building a fence to keep rabbits out of your garden are worth every minute of extra effort. Enjoy your garden and your wildlife--together, yet apart. Choose sturdy posts at least 4 feet long, either metal poles with brackets for hanging fence-mesh or wooden posts, to which you can staple the mesh. Choose either enough 2-foot-wide rabbit mesh or poultry netting to circle the garden twice, or a single 3-foot round of rabbit mesh and an 18-inch-by-2-feet-wide round of poultry netting. Note that garden netting comes in a wide variety of strengths and gauges. What you want is metal mesh with small-gauge holes, because metal is one of the few things rabbits can't chew through. Small-gauge holes are approximately 1-inch square. Young rabbits have been known to get a running start and hurl themselves through 3- to 4-inch square holes. You may also want a roll of plain wire to weave between overlapping layers of mesh or netting. Rabbits jump, climb, chew and dig. All three attributes have to be addressed to build a successful rabbit-proof fence. A height of 3 feet or more addresses jumping. Seat posts securely and standing straight up to prevent climbing. Metal mesh addresses chewing. Sink fence mesh below ground level, and you have dealt with the digging issue as well. Dig holes and seat posts securely at a depth of 1 foot. Between posts, dig a narrow trench 6 inches deep, all the way around your garden bed. Seat your first round of rabbit mesh in the trench, and attach it to the posts. Overlap the second round of mesh by 2 to 4 inches, and secure it to the posts. Use a single wire to stitch overlapping layers together. Restore dirt to your trench, and tamp it down hard on both sides of the mesh. You now have a fence with a 6-inch digging barrier and a height of approximately 3 feet. Follow the directions given for securing fence posts for an all-mesh fence. Instead of a narrow trench, however, dig a 3- to 4-inch deep apron 12 inches wide, all the way around the bed. Flatten poultry netting, and lay it in the shallow apron, curving the remainder up to secure it to the posts. Since netting is fairly lightweight, you may find it easiest to lay it in the shallow apron and cover it with dirt before trying to secure it to your posts. Alternatively, have a helper stand on the flattened netting while you attach it to the posts. Once you have secured the netting, overlap the rabbit mesh and attach it to the posts to finish your fence. Some veterans of rabbit wars are certain that this wide, horizontal digging barrier is more successful at repelling rabbits than the narrow trench. You will not be the first gardener to leave the garden gate out of your rabbit-repelling plans. Check the margins, and add a petticoat of poultry netting or mesh if it looks vulnerable to rabbits. 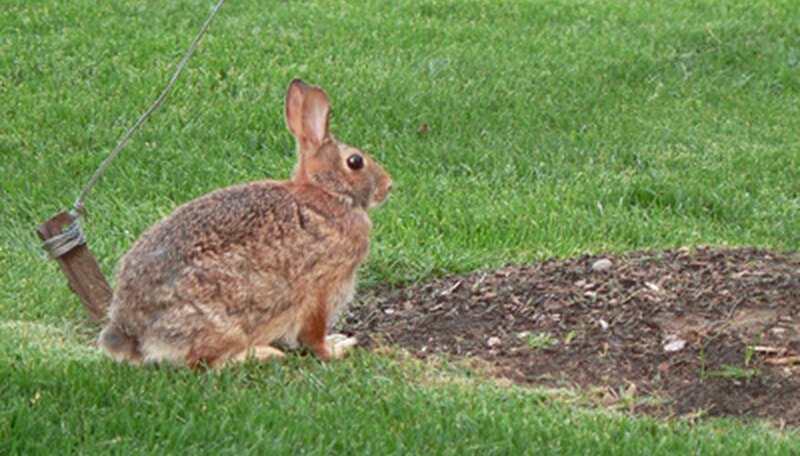 Throughout the season, check your work at least weekly; hungry rabbits will check daily. Shore up or repair vulnerable areas as they occur. Your vigilance will make a big difference in how well your fence works.